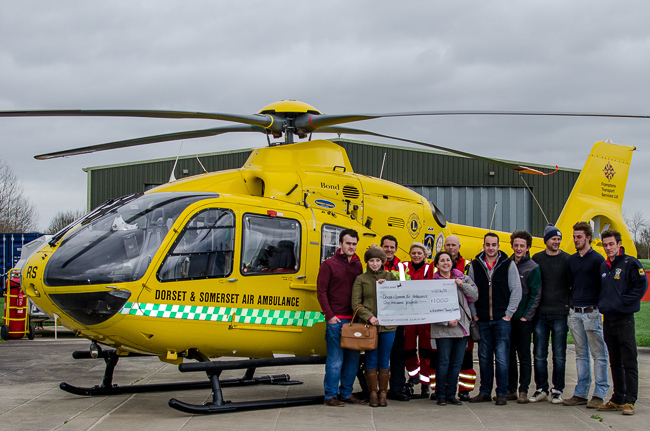 This year the clubs fund raising event raised �00 donated to our 2015 charity the Dorset and Somerset Air Ambulance. Club members presented the cheque to the crew at Henstridge air field on Saturday 5th December. Those who attended were treated to a tour of the aircraft and facilities and were given refreshments before a call came in and we were able to watch them take off. A really enjoyable morning and a pleasure to help support such a worthy cause and one that is very appropriate as so many accidents with farmers involve air ambulance. Well done all that helped this worthy cause. Wincanton Young Farmers Club was founded in March 1937 and is now in its 75th year. Young farmers is open to everyone between the ages of 10 - 26 who would like to join; you do not have to be involved in agriculture as many of the members will tell you. If you want to take part in sports and competitions, attend visits and talks, raise money for charity, go to parties, discos and balls, and most of all have fun then come along! There are 25 clubs in Somerset, split into five groups. Wincanton is in Wessex group along with Langport, Illminster and Crewkerne. Each club is run by the members so you help decide what you do! We meet every other Tuesday at The Dolphin Hotel, Wincanton at 7.30pm.